Maitake mushroom is one the most popular medicinal mushroom it has a long history being used in traditional Chinese and Japanese medicine. Maitake mushroom also known as Grifola frondosa has many different health benefits. It is rich in minerals, vitamins, fibers and amino acids. Research has shown that Maitake stimulates the immune system, prevents cancer cell growth and lowers blood sugar levels helping to control diabetes. So it is indeed fitting that this mushroom is also known as “King of Mushrooms”. Even if you are perfectly healthy, you may want to boost your immune system. Healthy immune system will help body to fight off viruses and infections. Maitake is natural immune system enhancer because it contains various minerals and vitamins but mainly because it consists beta-glucans. What are Beta Glucans in Maitake? Beta glucans are natural polysaccharides, a group of molecules that can be found in the bran of cereal grains, yeast, bacteria and of course in mushrooms. Beta glucans found in medicinal mushrooms are particularly useful because of their strong ability to enhance immune system. Ingesting these molecules will activate body’s immune system by enhancing macrophages and natural killer cell activity. Maitake does not only stimulate the production of the immune system cells, but it can also make these cells work more efficiently and effective. It will increase body’s production of naturally occurring chemicals that target foreign compounds. All these effects help to prevent spreading of cancer and protect cells from becoming cancerous. Maitake can also help to relieve the effects of chemotherapy by lessening the side effects including hair loss, pain and nausea. 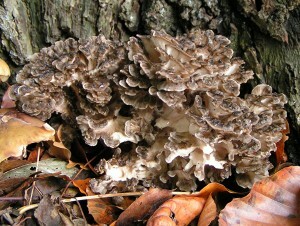 In Asia Maitake extract is used along with chemotherapy. In addition being a powerful immunity booster, and it’s ability to fight cancer this mushroom has other possible uses. These include controlling blood sugar levels, high cholesterol and high blood pressure. It has also been used to lose weight. The active compounds of Maitake are available in many forms fromvarious producers. Hot water extraction is typically used to extract the active ingredients from the mushroom. This way the polysaccharides can be collected to be used in concentrated amounts. Well known Maitake extract is called D-fraction. It contains about 30% beta glucan extracted from Maitake mushrooms. This extract is purified and standardized. It is often advised to use raw Maitake powder with any of the extracts because the exact mechanisms of all of the mushrooms beta glucans are still unknown. By taking both, extract and raw mushroom you can make sure that you are getting all the health benefits of Maitake mushroom. Maitake mushroom is one of the strongest medicinal mushrooms, and it’s health effects are plentiful. The beta glucans in it seem to support body in many ways. It is no surprise that it has been used in Asia for thousands of years. There are three main standardized Maitake extracts. Maitake D-fraction and MD-fraction are used to treat cancer. SX-fraction maintains healthy blood sugar levels and is developed for people suffering of diabetes. Agaricus subrufescens (incorrectly known as Agaricus blazei) is a medicinal mushroom with a variety of health benefits. Inlcuding benefits for immune system, cancer treatment and liver dysfunction.